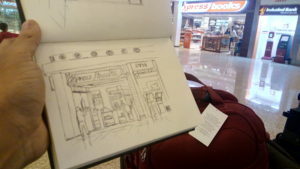 Started my sketches from Mumbai airport itself. I had to spend nearly 8 hours on the airport. 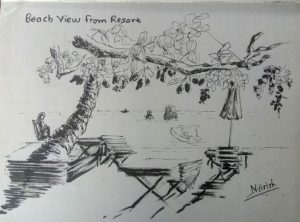 But when one has a pen and paper, and an urge to sketch, there’s no place for boredom! 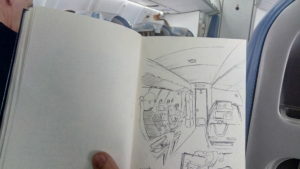 The sketching continued in the plane from Mumbai to Bangkok and then to Koh Samui. There was a ferry from Koh Samui to Koh Tao. 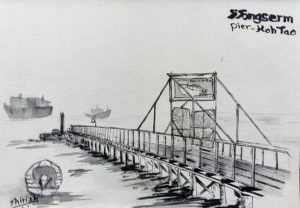 This was done while waiting for the ferry at the pier. 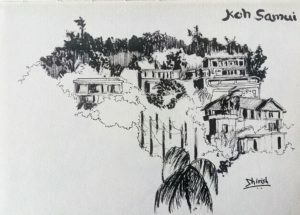 Koh Tao was another magical place where I got many sketching opportunities. 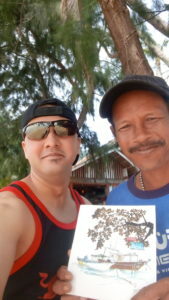 These were done from the restaurant belonging to the diving resort (Big Blue) where I did my diving. 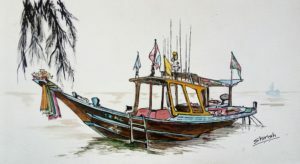 And I did this one of a taxi boat near the shore and gave the soft copy to the boat owner (Faan), who was ecstatic to see it. 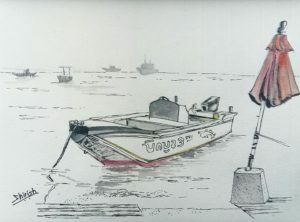 Faan’s friend requested me to sketch his boat as well. So I did that too! 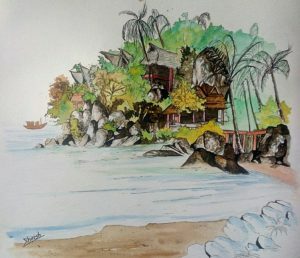 Koh Tao had experienced massive floods in the months of Nov-Dec, and though the cleaning has been done, so aftermath is still visible in broken roads and water clogging at places. This is a glimpse of the road where my dorm was located. 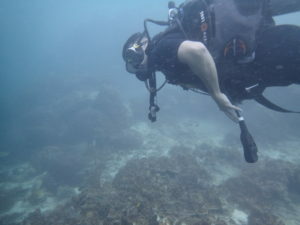 The group of islands like Koh Tao, Phi Phi and Samui enjoy great rock formations alongside lush greenery. 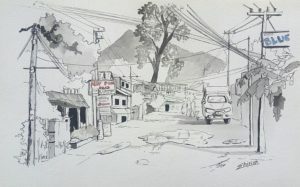 I tried to capture some of it in this sketch. 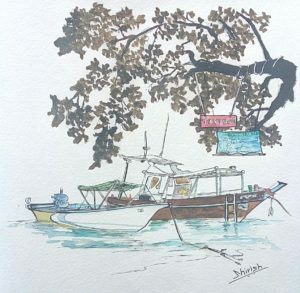 After a week of diving in Koh Tao, I returned to Samui via ferry. 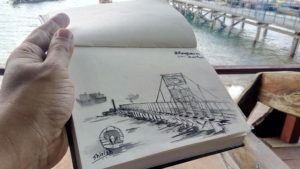 Sketched this one at the pier when waiting for the ferry. 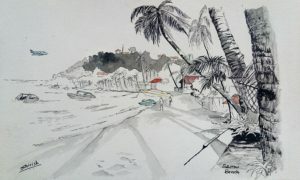 And ended the sketching adventure with this sketch of Samui beach, just behind the hotel I was staying in. The twin waterfall paintings I did as a commission work for a family member. 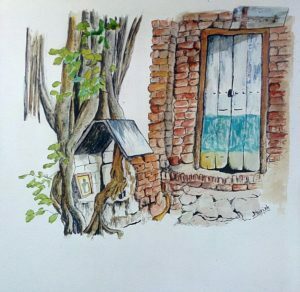 The requirement was to have 2 paintings on a common theme, to be displayed on 2 sides of a red wall. 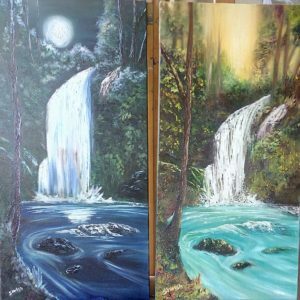 So I chose to paint the same waterfall, one during day and the other one in moonlight. It proved quite a (wonderful) challenge, and the results were quite pleasing for me 🙂. Oils and acrylics on stretched canvas. 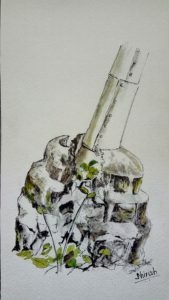 Each painting size 12″x24″. 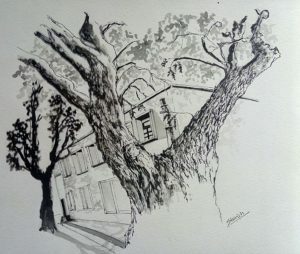 Did these 2 sketches yesterday in University of Pune. 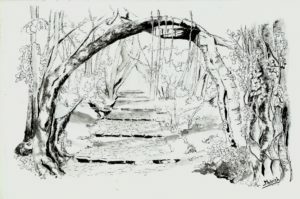 Steps between the various descendants of a single Banyan tree.